If you like Breaking Bad or Better Call Saul then you should check out this Gus Fring Bobblehead. 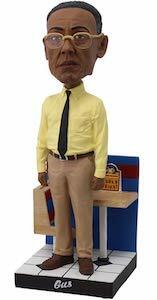 The bobblehead shows Gustavo Fring in his typical khaki pants and yellow shirtband he is standing in his famous chicken restaurant Los Pollos Hermanos. The figurine of Gus is 8 inches tall and he will shake his head at you all day long if you want. We all know Gustavo is a one smart business man that seems to be good at hiding his not so nice businesses. So if you want some cool memorabilia from Breaking Bad and Better Call Saul then adding this bobblehead to your home is a great idea. 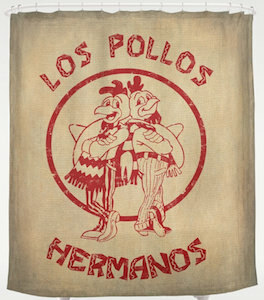 If you like chicken the Breaking Bad style then you just have to check out this vintage looking Los Pollos Hermanos shower curtain. The shower curtain is just perfect for true fans of Better Call Saul and Breaking Bad or if you just like chicken men. The shower curtain has a brownish background with in red a worn looking Los Pollos Hermanos logo. The Better Call Saul shower curtain is 71 x 74 inches and can be machine washed and dried if it would get dirty. Dress up your bathroom in style with this amazing looking shower curtain with the famous Los Pollos Hermanos logo on it. Now there is a Los Pollos Hermanos Trucker Hat for all the fans of Breaking Bad and Better Call Saul. 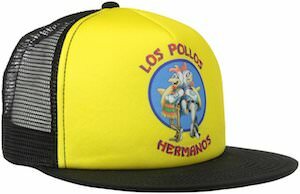 The trucker hat has a black visor and black mesh back and the front is yellow with on it the famous logo of Los Pollos Hermanos. On the mesh back it also has the Breaking Bad logo so that people know what TV shows you watch. And like any good trucker hat, this is a snapback so that you can adjust it to fit your head just perfectly. Now that Los Pollos Hermanos shows up in Better Call Saul it would be a great time to start wearing a hat to remind people about this famous chicken restaurant. 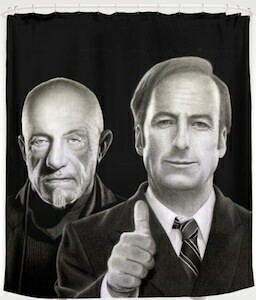 This Better Call Saul shower curtain shows Jimmy and Mike. The amazing looking shower curtain is 71 x 74 inches and has 12 eyelets for your shower curtain. And you can wash this shower curtain in the laundry machine when it gets dirty so that it always look good. The shower curtain is black and on that, you can find Jimmy McGill or maybe we call him Saul and Mike Ehrmantraut and they look ready to serve you. 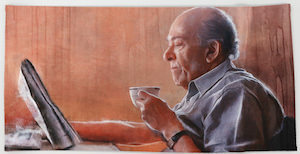 Even fans of Breaking Bad will like this shower curtain as it just shows the same characters we know see on Better Call Saul. 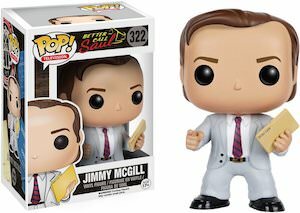 Now there is a Jimmy McGill Pop! figurine for all the fans of Better Call Saul. The figurine looks like the perfect Jimmy in his light colored suit and perfect hair and he even brought a dossier that says “Elder law” on it. The 3.75 inches tall figurine is just what you need if you collect Better Call Saul stuff as this is the man it is all about so he should not be missing in your collection. And Jimmy McGill comes in a nice box with window so that you can keep him look like new if you prefer that. If you need the number of a lawyer handy then this Better Call Saul air freshener is what you need. 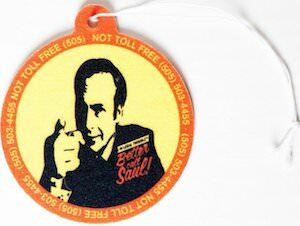 The inside of the air freshener is yellow with a silhouette of Saul Goodman and the Better Cal Saul logo and on the edge, on an orange background, you can find his Not toll free phone number. And with a lemon scent, this air freshener actually makes your car smell fresh again and that is a plus too. I wonder if Heisenberg has this air freshener in his car. 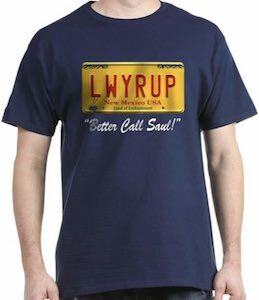 Now there is a Better Call Saul t-shirt that everyone will like. The t-shirt is available for both men and women and comes in sizes Small – 6XL and is made from 100% cotton. 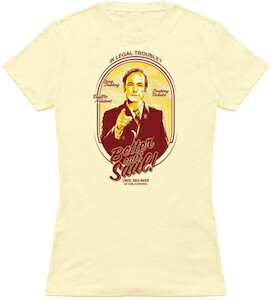 On the t-shirt you can see Saul Goodman and he is pointing at you. The t-shirt also says “In Legal Trouble? 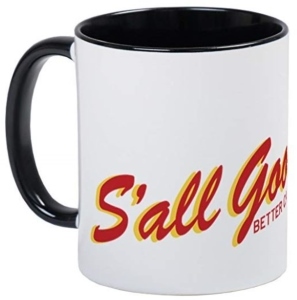 Better Call Saul!” and it shows some things you need him for and of course his phone number. A t-shirt like this is great fun to wear because people are going to recognize Saul from his TV series and from Breaking Bad.